Discrete switched capacitor filters still offer a viable and flexible option for signal processing. Allied Component Works recently worked on a customer application requiring a discrete active filter for a control system’s analog input signals in a subaudio frequency range. An eight pole butterworth filter was needed, and needed fast, to stabilize the customer’s control system already fielded in a large industrial application. The prospect of designing a discrete active filter from op-amps was daunting at best and unlikely to fill the need in a timely manner. 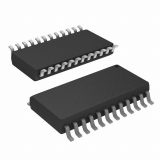 A small microcontroller and a switched capacitor filter chip were employed to provide exactly the needed performance with an additional ability to vary the frequency and phase characteristics of the finished product in the field. Largely thanks to the flawless performance of the chosen switched capacitor filter chip (LTC1164-5), the project was completed successfully from concept, to design, assembly, and installation in only three weeks. In a world now dominated by digital techniques, these switched capacitor filters are rather old components. Few new products of this type have been introduced in decades. But sometimes these clever parts from years past serve just the need at just the right time.